With Canada's recent signing of the Trans-Pacific Partnership (it still needs to be ratified), and issues of economic growth--or the lack thereof--dominating news headlines, we thought we'd share the latest data from Statistics Canada on Canadian international trade flows. The viz can be found here. 1. Since 1997 (as far back as this dataset goes), the values of Canada's imports and exports have generally risen each year, with the most notable exception being the drop-off experienced during the Great Recession of 2008-09. Since then, the values of our exports and imports have recovered to their long-run growth paths. 2. 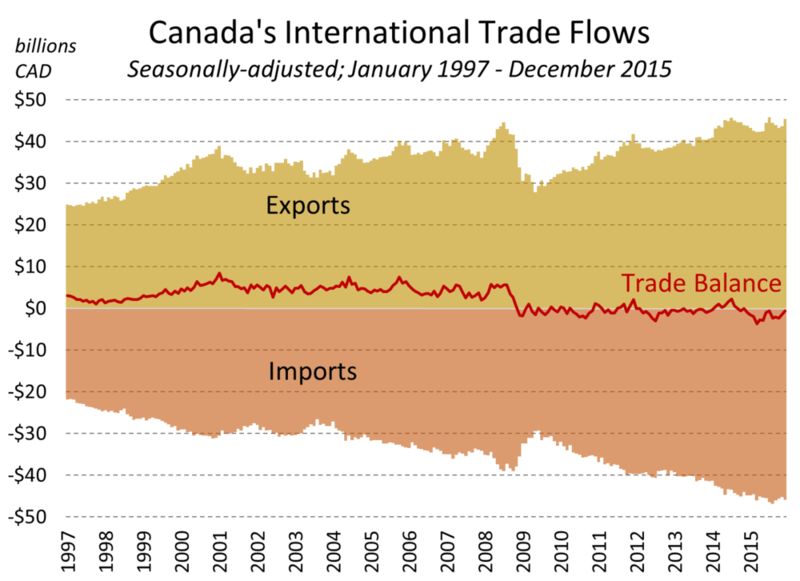 After maintaining a trade surplus for the 12 years leading up to 2009, Canada's trade balance has oscillated around zero since then, with much of 2015 spent in trade deficit. Where will 2016 take us? A lot depends on how the Canadian domestic market fares given the economic headwinds we're facing (which could result in fewer imports), and also on how the American and Chinese economies plug along throughout the year, with conflicting news and data on how strong each of those countries' economic fundamentals currently are (which could affect exports).